If you need to get about the city, a bike is a great way of doing so. However, as we pointed out in our Volt Pulse review, cycling to the office can get you hot and sweaty - not a great way to start the day. That is why e-bikes are great, as they'll carry you there without you getting drenched. But here's an better thing; an e-bike that can fold up and fit in your backpack. That's the Smacircle. Currently seeking backers on Indiegogo, the Smacircle a fully battery-powered scooter with a 12 mile range on one charge. The Samsung power pack needs just 2.5 hours to charge, and the whole thing weighs just 15lbs. Furthermore, as you can see in the video, it can fold up to fit in a normal backpack, which is pretty revolutionary. 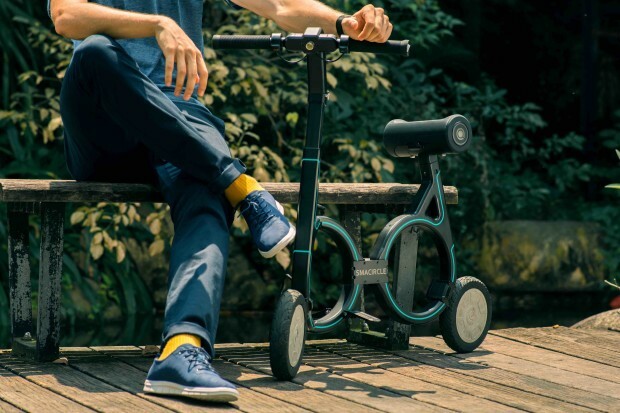 As well as being able to charge your phone, the Smacircle e-bike uses an app to unlock it, so only you can power it up to ride. We're quite excited by this, as that folding design, and the decent range, means it could a very simple go-to city vehicle.